NEW BRITAIN - The Connecticut youth mentoring organization Nutmeg Big Brothers Big Sisters presented New Britain’s Cynthia Romero with its 2018 Victoria L. Soto Award. Romero received the award, which was created to honor Victoria L. Soto-a teacher at Sandy Hook Elementary School who died protecting first graders under her care in the 2012 shooting-at the organization’s Big Brothers Big Sisters of the Year Awards event, held May 24 at the West Hartford Conference Center in West Hartford. 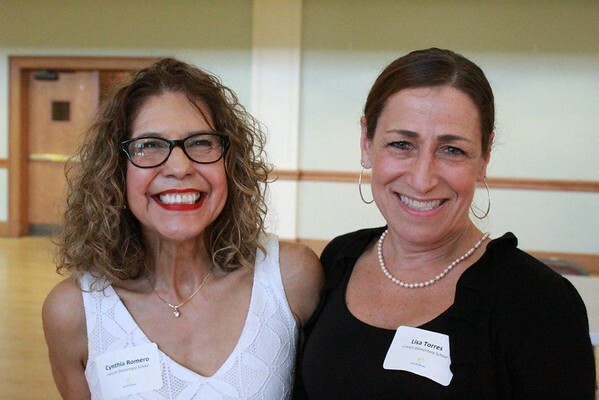 Soto was a mentor with Nutmeg when she was an education student at Eastern Connecticut State University. Romero spent the last decade as a social worker at Lincoln Elementary School. Nine years ago, she became an advisor to the “Beyond School Walls” youth mentoring program, which is managed by Nutmeg. As a “Beyond School Walls” advisor, Romero handpicked more than 250 third, fourth and fifth graders from Lincoln who have benefitted socially and intellectually from it over the years. Now, after a 20-year career in the New Britain School System, the New Mexico native and mother of three is planning on retiring at the end of the month. Hartford-based Nutmeg Big Brothers Big Sisters offers its life-changing mentoring services to children in 132 of the state’s 169 municipalities. To learn more about the organization, go to: www.nbbbs.org . Posted in New Britain Herald, Business on Friday, 15 June 2018 20:52. Updated: Friday, 15 June 2018 22:07.